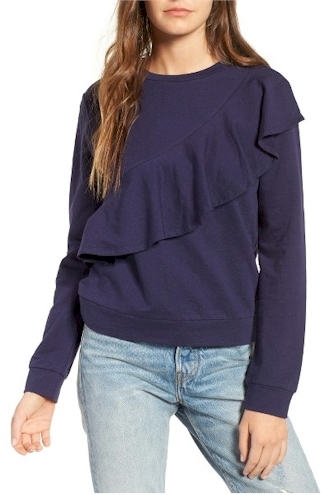 Nordstrom has got this Love, Fire Ruffle Front Sweatshirt on sale for $23.40 with free shipping and free returns. It comes in two colors, navy and heather gray, and in sizes XS through L. Most of the reviews say that this shirt runs small, so make sure to order one size up. 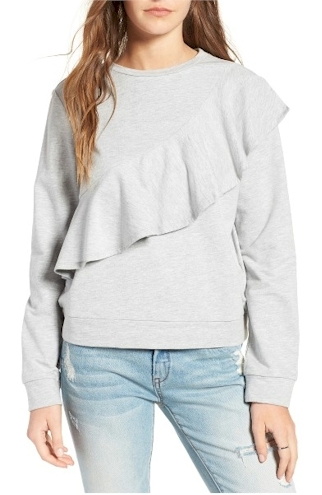 Description A fluttery bias ruffle puts a playfully feminine spin on a relaxed sweatshirt cut from comfy French terry with a hint of stretch.